Summary: Hallie and Grace Weston have never exactly seen life eye to eye. So when their father dies and leaves everything to his new wife, forcing the girls to pack up and leave San Francisco for a relative’s house in shiny Beverly Hills, the two sisters take to their changing lot in typically different styles. 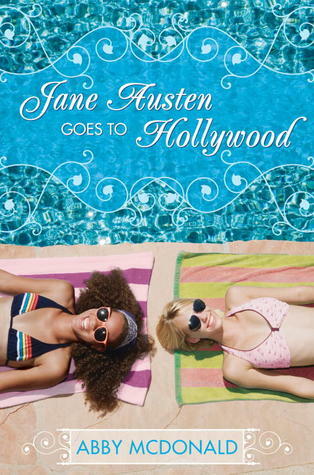 Jane Austen Goes to Hollywood is a pretty fun modern adaptation of Sense and Sensibility. The 18th century gentry of Jane Austen’s time are replaced by two sisters living the rich life in Beverly Hills. At first, I was put off by the super wealthy lifestyle of almost everyone in this book, until I realized how perfectly it matched Sense and Sensibility. After that, I managed to sit back and enjoy the ride. The light tone of the book reminded me of the movie Clueless (a modern adaptation of Jane Austen’s Emma!). A variety of side characters come and go, bringing humor and color to the story. (My favorite was Grace’s lab partner, Harry the Asian skater boy.) I was pretty impressed by the way each of the characters was updated. The younger sister Grace is sensible and cautious, while her older sister Hallie is a drama queen dreaming of making it in Hollywood. I was also put off by Hallie’s constant dramatics and lack of perspective, but, once I decided to just enjoy the book, Hallie stopped being irritating to me and became hilarious. Overall, the book was a hilarious read. The Gatsby-esque parties and over-the-top characters did take some getting used to, but I had fun waiting for Grace and Hallie’s respective romances to pan out. Recommendation: Borrow it someday if you’re planning to swing by the library — especially if you’re a Jane Austen fan or just looking for some light summer reading.